A family finds temporary shelter at a school in Aden Governorate, Yemen. The violence in Yemen continues to wreak havoc upon the country's civilian population and restrict humanitarian access to those most in need amid a spate of aerial attacks and ground incursions, the United Nations has reported. In the last 24 hours alone, air strikes aimed at halting rebel activities have hit the Yemeni cities of Aden, Al Dhale'e, Sana'a, Sa'ada, Al Hudaydah, and Hajjah Governorates killing at least eight civilians, according to information provided today by the UN Office for Coordination of Humanitarian Affairs (OCHA) and the press. At the same time, clashes are continuing in the country's south as Houthis and Government forces battle in Aden and Ma'ala, where a number of civilian targets have reportedly been destroyed including four residential buildings and a number of bridges connecting two major roads from Aden. The situation in Yemen has been rapidly deteriorating since the country formed a new Government in November 2014 aimed at ending a period of political turbulence and bringing about a full transition towards democracy. The country continued to be plagued by violence and political demonstrations despite UN efforts to bring about a peaceful political resolution. As the fighting has ratcheted up in intensity, the World Health Organization (WHO) today released its estimates suggesting that more than 540 people have been killed and some 1,700 others wounded by the violence in Yemen since 19 March. The UN agency reported that on 4 April two volunteer paramedics with the Yemen Red Crescent Society in Aden were shot when their ambulance was hit by gunfire while, in another incident, one security guard was killed and two nurses were injured in the health centre of Al-Mazraq camp for internally displaced persons. The Geneva-based health agency added its emphasis that all combatants respect the protection of health facilities under international humanitarian law and underscored that patients be guaranteed their basic right to health without further endangerment to their lives. On a similar note, the UN Children's Fund (UNICEF) voiced concern about the escalating number of child deaths in Yemen due to the hostilities. At least 74 children are known to have been killed and 44 children maimed so far since the fighting began but the figures, UNICEF said, are “conservative” and the UN agency believed that the total number of children killed is much higher. “These children should be immediately afforded special respect and protection by all parties to the conflict, in line with international humanitarian law,” he added. UNICEF reported that its teams were on the ground working to provide families with safe water and essential health services while also prepositioning therapeutic food and oral rehydration salts for young children. Nevertheless, the agency continued, the conflict is exacerbating the already precarious situation for children in one of the region's poorest countries,” with much of Yemen already prone to food insecurity and with sever acute malnutrition widespread among young children. Against that backdrop, increasing numbers of people from Sana'a and Sa'ada are reportedly being displaced to Amran Governorate, just north of the country's capital. 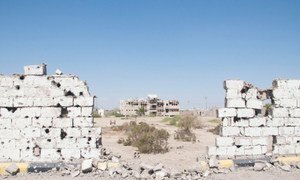 OCHA said local partners estimated that up 28,000 people had moved into Amran since the beginning of the crisis and warned that the fighting risked interrupting humanitarian access, such as medical supplies, to those civilians most in need. In addition, the ongoing shelling in Aden has disrupted the city's waterworks with the need to ensure a reliable water supply becoming an “urgent priority” for humanitarian partners. Noting Saudi Arabia's announcement that, at the request of the Government of Yemen, it has begun military operations in the Gulf nation, United Nations Secretary-General Ban Ki-moon called on all parties to ensure the protection of civilians and emphasized that despite escalation, negotiations remain the only option for ultimately resolving the crisis.